Back when I saw him regularly, Carl seemed like he never was going to age. Even well into his 60s, he was skinny with little gray in his brown hair and skin like that of a much younger man. He regularly played pickup basketball with men many years his junior. He was one of the wittiest men I’ve known, always pinning goofy nicknames on people and finding the humor in mundane situations. And he impressed me as one of the most committed Christian men I have met, a family man, a man I admired more than most. Carl (not his real name) was far from perfect; he made mistakes, and those had consequences. We all can relate. I haven’t seen Carl for several years. My fault. I don’t like to release people from my life and allow them to become just wonderful memories. But, well, we just fell out of touch. Still, I have been told God sends certain people into our lives for a reason. Even if they don’t always stay “in your life,” the reason can remain. My friendship with Carl continues to impact my life every day. In 1994, his first granddaughter died while just a baby. That devastated Carl in a way I didn’t comprehend until I had my own grandchildren. Even though I couldn’t completely empathize with him and his family, I loved him and hurt for him. So I went to the funeral, held at a small Catholic church in central Missouri. I made the two-hour drive by myself, arriving before anyone else. Perfectly comfortable in an empty church, I entered and sat in one of the back pews. I had been listening to some inspiring Christian music during the drive, so I was in a prayerful state of mind. 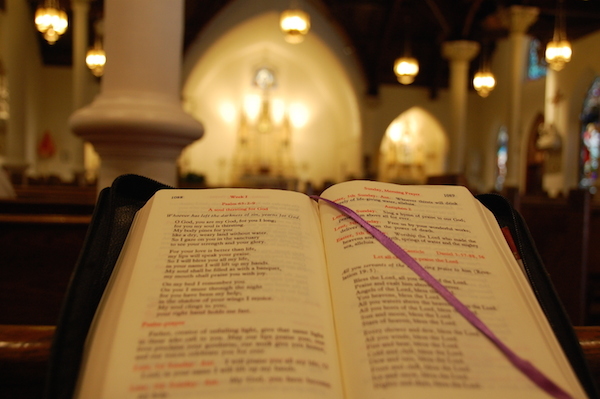 “What’s this?” I wondered as I reached for a small-but-thick red book in the pew. I noticed every pew had copies of the same book. Though a cradle Catholic who loved to pray, I never had heard of the Liturgy of the Hours, also called the Divine Office. Curiosity — no, it was stronger than that — drew me inside. I saw selections from Scripture and prayers and songs. Everything seemed arranged in an organized way: Morning Prayer, Daytime Prayer, Evening Prayer, Night Prayer. That day, I discovered something that would change my life. My mom gave me a copy of the book as a Christmas gift that year. I came to learn that the Divine Office is the official prayer of the Church, that monks and nuns and religious throughout the world pray it daily. I also learned that some lay people were devoted to it as well. I really didn’t know how to pray the Office, didn’t know where to begin, but I gave it my best shot. I have tried to be dedicated to Morning Prayer and Evening Prayer each day since then — sporadically, sometimes, and I missed one entire year when I struggled to pray in any way at all after a suicide attempt. The Office has become a part of me, though. Some of the regular lines of the prayer are ingrained deep in my psyche, such as one of the openers: “God, come to my assistance. O Lord, make haste to help me.” I have learned the beauty of the Psalms and using them in daily prayer and have come to love especially what I have found in Psalm 51, for example, and the way my soul’s existence is reflected in Psalm 77. I can direct my own personal prayer in meditation; God can lead my heart into conversation where He wishes us to go during my praying of the Office. My original book is worn out, held together by tape, and this Christmas was replaced by a brand-new set of four complete volumes. The new books are in larger type, easier to read in older age. I plan on spiritually joining those who daily pray the Office throughout the world for many years to come. And so my love for Carl continues to pay dividends every day of my life. I need to call and thank him.